Have you ever needed to find the time zone of a Contact? This WTF episode is for you then my friend. 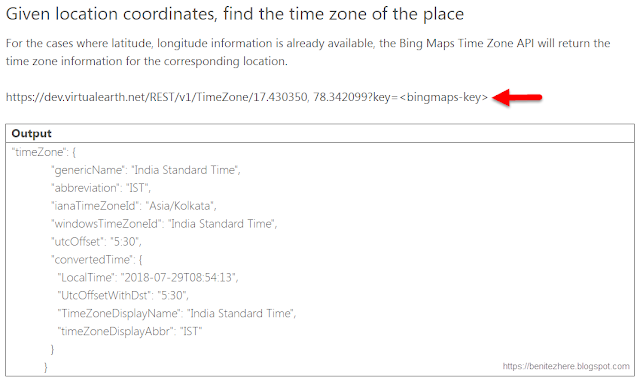 Time zone can be easily identified through the power of a Bing Maps API using a couple of connectors and an expression in Flow. No code! 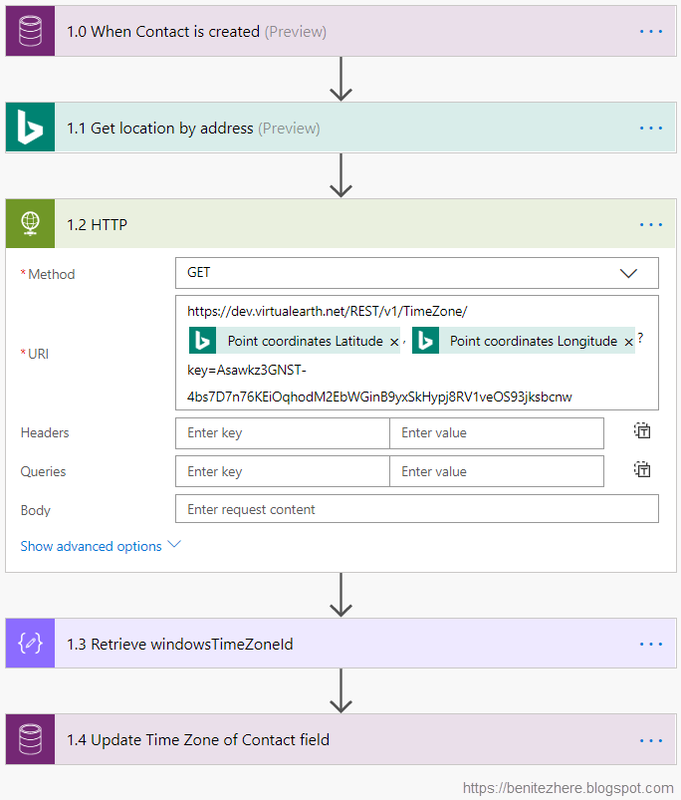 Before I share the steps with you, I want to talk briefly about the Bing Maps Time Zone APIs available as I'm using one of them in my Flow. Last year the product team made Bing Maps Time Zone APIs available which you can read from this Bing Maps blog post. The Bing Maps Time Zone API I am using is "Given location coordinates, find the time zone of the place." I decided to use this one instead of "Given a place name, find the time zone of the place" because personally I find that using latitude and longitude coordinates would be more accurate rather than using a place, such as a city. To use the Bing Maps Time Zone API (and Bing Maps Flow connector which I'll get to soon), you need a Bing Maps key. I signed up for a Bing Maps Basic Key to use a Bing Maps Flow connector and the Bings Maps Time Zone API. If you are going to be using this in your organisation or if you are a consultant and will include this in your solution design, you need to review the Bing Maps licensing options beforehand to understand if this is a valid solution design. For the trigger of my Flow, I'm using the When record is created CDS trigger. I want the Flow to trigger when a Contact is created. The next step in my Flow is to use the Bing Maps action of "Get location by address." This will retrieve latitude and longitude coordinates from address data. We will use the address data from the Contact. The assumption here is that an address is entered against the Contact in the model-driven app in the Contact entity. When the Bing Maps action successfully returns an output, it looks like the following where you will see the latitude and longitude coordinates. 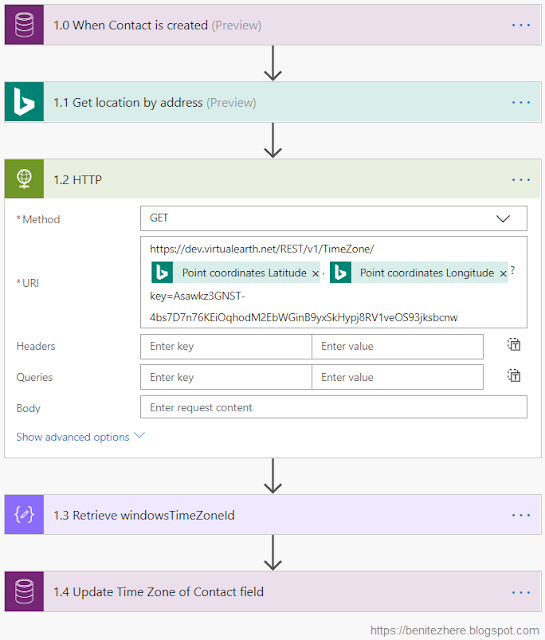 To use the "Given location coordinates, find the time zone of the place" Bing Maps API we need to use the HTTP action and reference the URL provided in the Bing Maps blog post. Simply reference the latitude and longitude outputs from the previous step, followed by inserting your Bing Maps key. The Bing Maps API will then successfully retrieve the Time Zone of the Contact. Pretty cool right? If you need to sore the time zone value of the Contact, you can do so by creating a custom single line of text (string) field in your Contact entity in CDS. The property that will be retrieved from the JSON response is the windowsTimeZoneId from the timeZone object. This is what will be stored in the custom field in CDS. There's two options that will allow you to retrieve the windowsTimeZoneId property successfully. You can use the Parse JSON action where you'll be required to copy and paste the JSON response from the HTTP action to generate the schema. The next step is to use a Compose action. When you select the Compose action and review the Dynamic Content values presented, you won't see the timeZone object as it is in the array of resources as seen in the JSON response. If you select resources, you'll then see an apply to each magically appear. John Liu has a blog post that outlines what you need to be aware of when using the Parse JSON action and he briefly talks about this behaviour. When you add another Compose action, the windowsTimeZoneId property will now be visible. It's not a bad option but it may be confusing. 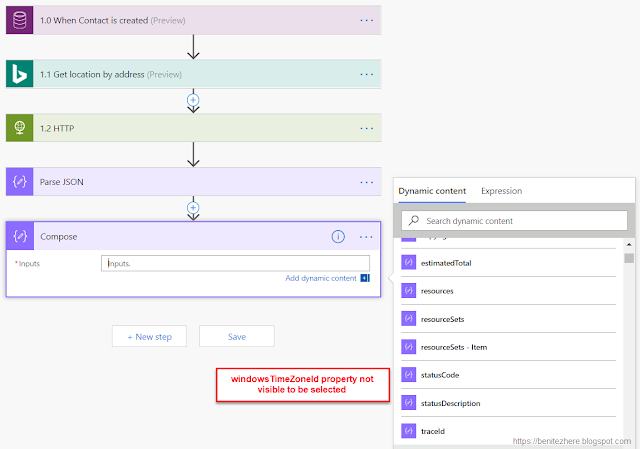 John Liu explained to me that if you don't want to use the Parse JSON action and simplify your Flow, you can use a Compose action to retrieve the windowsTimeZoneId property. From the HTTP action, get the windowsTimeZoneId property from the timeZone object which is in the resource array whose parent object is resourceSets. 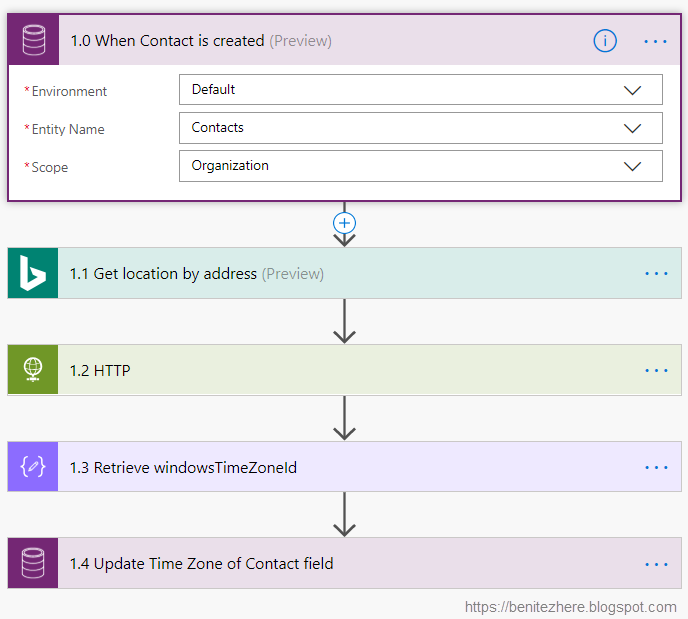 For either Option, make sure you have an action that will update the custom field in the Contact entity. 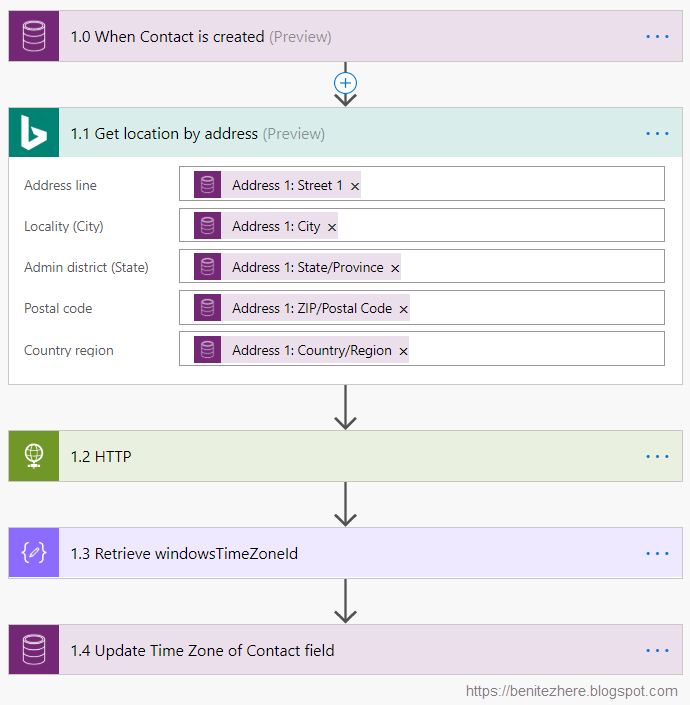 By using a Bing Maps Flow action, a Bing Maps Time Zone API and a Compose Flow action you can retrieve the time zone of a Contact in CDS through the address information without code. So cool! Flow is the best. This WTF Flow is available for download on the TDG Power Platform Bank.